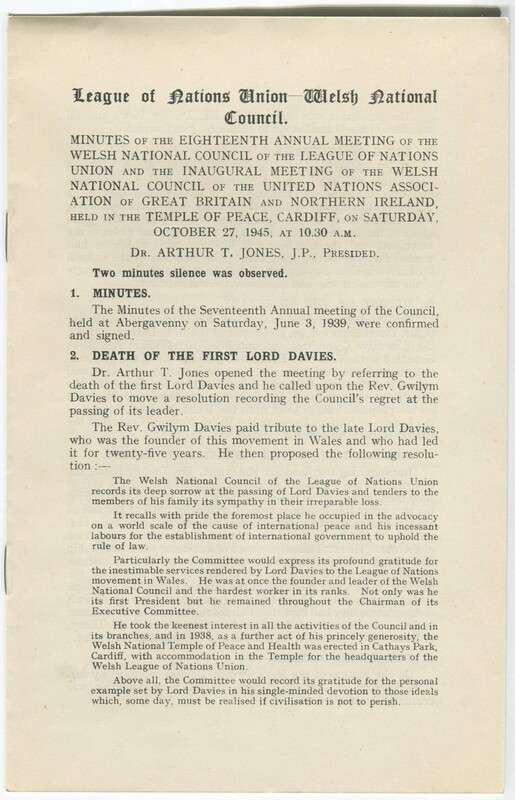 The minutes of the eighteenth annual meeting by the League of Nations Unions Welsh National Council held in the Temple of Peace, Cardiff on October 27th 1945. UNA-UK believes that a strong, credible and effective UN is essential if we are to build a safer, fairer and more sustainable world. They advocate strong government support for the UN and demonstrate why the UN matters to people everywhere. The United Nations Association of Great Britain and Northern Ireland (UNA-UK) - a civil society organisation founded in 1945 - has been a leading advocate for the UN since its inception. In fact, the Association pre-dates the UN. Growing out of the League of Nations Union, it held its first meeting before the UN Charter had been finalised.